This naturally sweetened recipe makes both jam and some dressing. 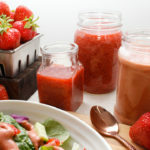 The jam is fantastic on toast and pancakes, with yogurt, ice cream, and the dressing is delicious on green salads, sliced avocado, or even loaded baked potatoes. And yes, it’s ok to eat some right out of the jar—even my dad has admitted in doing so! To a large sauce pot, add your jam ingredients and bring to a soft boil on medium heat. Reduce heat to low and simmer uncovered** for 30-40 minutes until some of the liquid evaporates. Once ready, you can mash the jam a little if you wish. Transfer jam to your favourite jars, cover with lid and reserve 1 cup for the dressing. For the dressing, you can shake the ingredients in a glass jar or purée everything in a high-speed blender then transfer to a glass jar. Keep jam and dressing in the refrigerator for up to 3 weeks. Always use clean utensils to scoop out jam and dressing. If you decide to add chia seeds to help thicken the mix do so after the 30-minute mark, and mix well. * Using a cold extraction and raw Extra Virgin Olive Oil is great for the dressing. **Keep an eye on your jam while cooking as it can overflow if the heat is too hot.